Sera and I have been living here in southern Africa now for just under 2 months. We have been busy with a fairly intense training schedule and thus we have learned and experienced quite a bit. 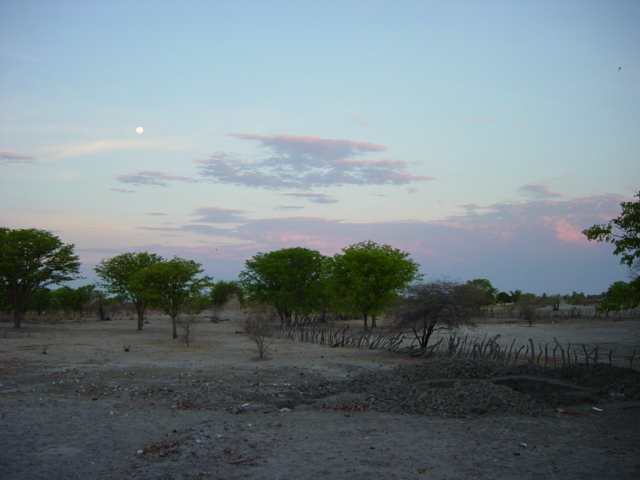 Below, I have described in detail the landscape, weather, and flora/fauna of northern Namibia as I have seen them so far. I also will try to include some of the pictures Sera and I have taken with the digital camera. The landscape here in the part of northern Namibia where we live is very flat. There are no outstanding hills, or gullies, or anything. Well this isn't entirely true, giant termite mounds are very common here and they serve to liven up the landscape a bit. The first thing I noticed here is that the sky is "bigger" somehow. I can see the sky from horizon to horizon 360 degrees around, and now that I think about it, there aren't too many places in Ohio where I could do that. I mean, there is always at least a hill, a house, or a stand of trees in the distance somewhere. I'm used to it now, but at first I would really notice that the sky looked larger here. Another thing that is neat is that because it is so flat I can see storms and such far off in the distance, as in "oh, it must be raining in Angola" far off. The sunsets are also often really spectacular here, although we don't really have a good view from our house in Omege. The typical flora here is rather drab on first glance. 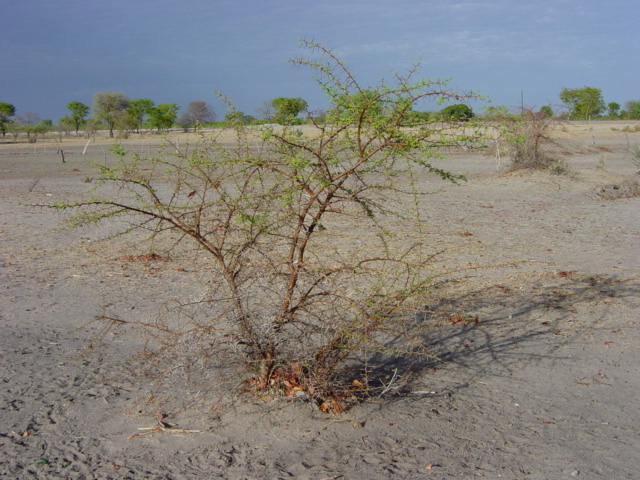 There are trees and bushes, but most of them are small and thorny. 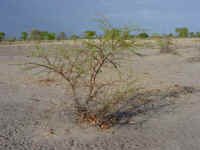 The most common tree is the Mopane; there are also quite a few palm trees. There are some big (normal) trees but they are few and far between. Actually, there are very pretty trees here that I had never seen before coming to Namibia, some covered with bunches of little purple flowers, but these were planted and protected with purpose and I don't see them away from the cities. I'm not sure exactly but I think that the natural landscape for this area has been much degraded by human use (over-grazing and such). The "topsoil" is very sandy but underneath the sand there is another layer made up mostly of clay. 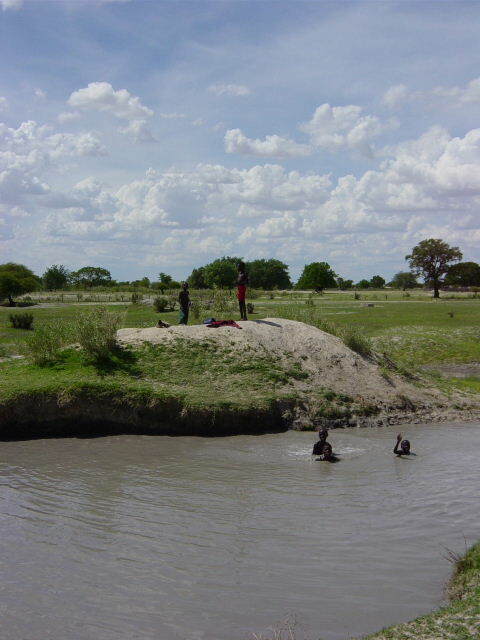 The result of this is that when there are small rains the water drains into the sand and/or evaporates quickly. 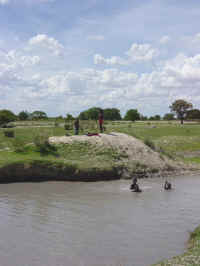 However, when there are heavy rains the water collects in huge, shallow pools because the clay layer doesn't let water through hardly at all. This leads me into a description of the Namibian weather. So far I have experienced the end of summer, and then the beginning of spring. Summer here is hot and dry. No rain, no humidity, no clouds, just perfectly sunny 90-100 degrees Fahrenheit days. The nights were a cool 80 and very quiet. This weather could be pretty awful if I had to do anything outside between 12 and 16.00. Even on the very hot days the shade would be comfortable though. About the last two weeks of November the rains began. The first few storms that came would only happen at night and were full of sound and fury but not much rain fell. Then, at the end of November we got a few heavy sustained rains and then a couple days later it rained for about a week strait. Now, several things happened here when the rains came that I didn't really see coming. First of all, the bugs, of which there were very few when I first arrived, came out en mass. What is interesting is that they come (and go) in waves. The first night after a heavy rain came the air was full of little mayfly type bugs. And then there were several nights of winged termites, and then little gnats. (When I say winged termites I mean bugs about 3/4 of and inch long with wings that come out of the termite mounds, fly around until their wings fall off, and then crawl around; they are attracted to light.) Now, several weeks after the rain began there is a steady mix of June bugs, moths, smaller winged insects every night, and an ever increasing number of mosquitoes. Also with the rain came these shallow pools, called oshanas, and the grasses that grow in and around them. These were a big surprise for all of us trainees. 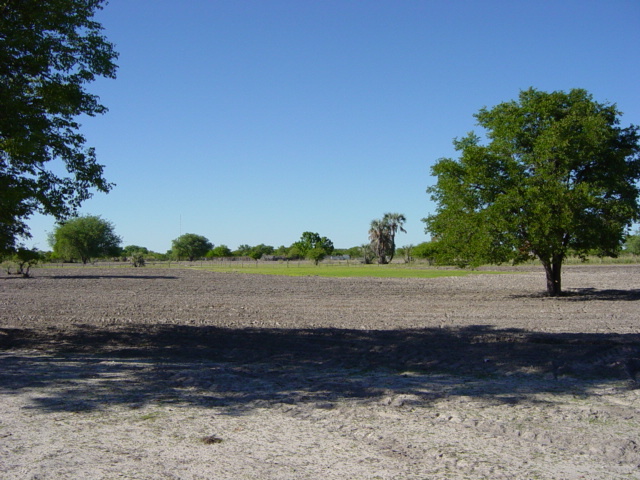 In early November the side yard here where Sera and I live was a sandy desert wasteland in which I couldn't imagine anything could ever grow. Now, in the middle of December it is a green meadow with tall grass, bugs, and frogs. These pools are everywhere and they make the village roads impassable unless you don't mind your feet getting wet. As of Dec 15, it hasn't rained for a week. The oshanas are still around, the bugs have calmed down, and the days are still hot, bright, and sunny. It hasn't been even close to cold here yet but I hear that in the winter it gets pretty close to freezing at night, we shall see. The fauna here is also noteworthy from an outsiders point of view. Out here in the rural areas one can expect to see goats, chickens, cattle, donkeys, dogs, ducks, and the occasional cat. The goats chickens, and cattle are free to roam as they wish. They do have owners but none of us can figure out exactly how people keep track of them. 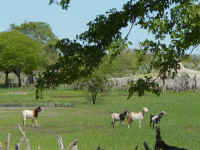 The village is covered with fences, but the animals find places to go through them rather easily. The chickens and goats are left to their own devices to find food; I have never seen anybody feed them anything. The goats eat all of the plants, which explains why the only plants that grow here naturally are covered with nasty thorns or are Mopane trees, which apparently must taste pretty awful. The chickens are pretty scrawny and I think they eat bugs and what people put in the garbage disposal, I mean throw out the kitchen window. The dogs and cats here are pretty much 5% pet and 95% tools, and are generally not respected and treated poorly. For example, the dogs are fed chicken bones and no one would even think to vaccinate their animals. I'm not sure but I don't think they have names either. The insects here aren't too different from the ones I was used to in the US. 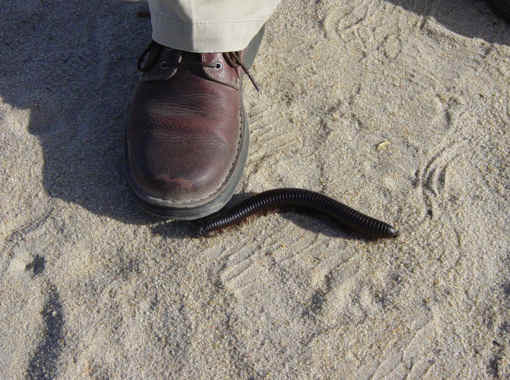 Giant millipedes and beetles are common and the flies here are more tenacious. There are also some wall spiders here that get as big as silver dollars, but they are not poisonous to humans. There are all sorts of lizards and colorful little birds, that I haven't identified yet as well. As far as exotic and dangerous African insects and animals are concerned I have only found and killed two small scorpions in our bedroom in Omege and have only seen one meter long spitting cobra found and killed about 30 feet from where we will be living for two years. Anyway, I will end the message on that note and I will send more letters soon.